I had quite a few comments yesterday about this bag. Thank you! But now I feel I have to tell the slightly funny story. This bag is from ifchic. If you've never heard of ifchic, it is a website were you can collect daily coins and then use then to buy products on the 24th of each month. I've been using ifchic since July. I typically only purchase one item a month so I don't go over the credit that I've collected. I told my husband about it and of course he had to take a look. He ended up creating an account and ordered this bag last month thinking it would be more of a laptop bag. No such luck. Well for him anyway! He passed it on to me and I am loving the compartments, space, and hands-free aspect! 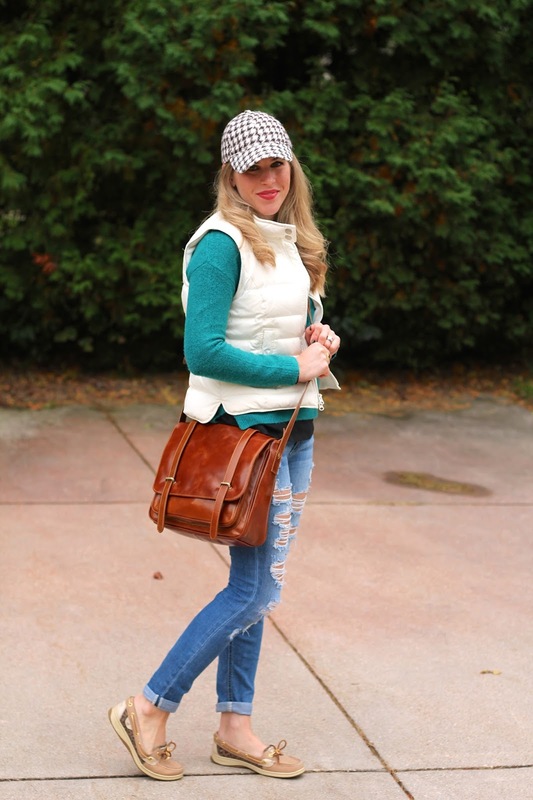 Who knew a murse would be so darn cute! This one isn't available anymore, but a black version is! I am obsessed with ifchic. I have gotten a lot of great things from it. Like my KYE bee shirt! love the bag--i have never heard of that service, but it sounds awesome! This is such a great crossbody bag, love this colour & cool service! What a great bag! Love the color! 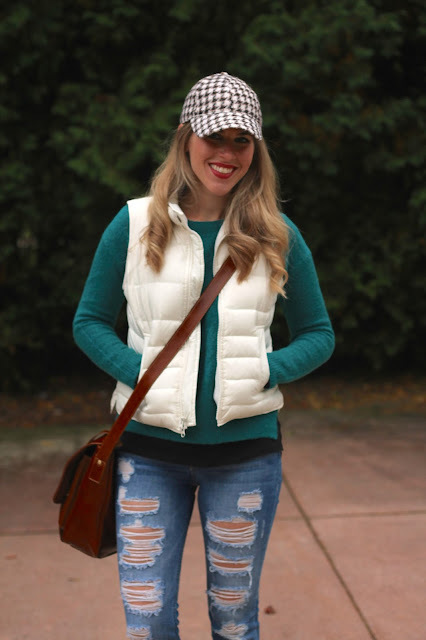 Your houndstooth hat is so cute! That is such a great size for a cross body! I love the adorable hat too! I have three purses from ifchic and think they are too cute. I love this handbag and I remember seeing it on the site however I thought it looked rather "masculine" so I didn't order it but next time I know better haha! Ha, love the story behind your bag. Looks like a great neutral that I'm sure will get plenty of use. 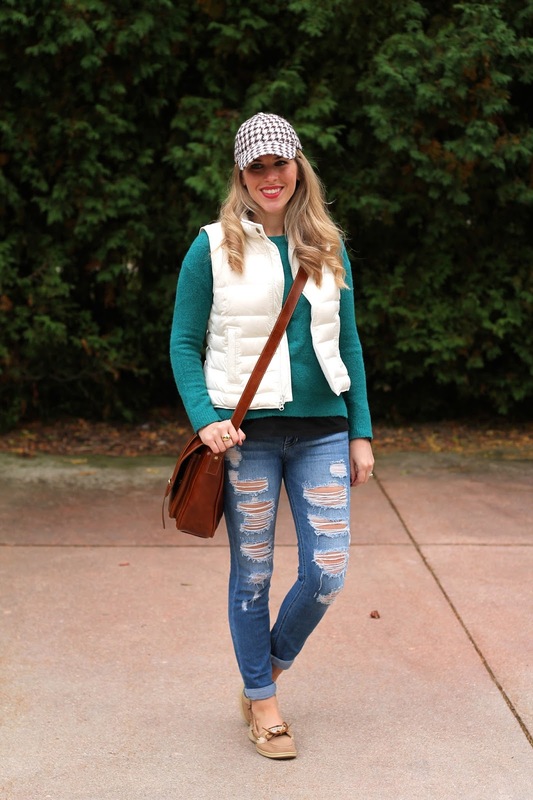 Perfect cute and cozy outfit, too! That is too funny that your husband ordered that bag for a lap top bag and then you took it :) Sounds like something I'd do! I love your hat! Love the bag! What a nice color! You have a very nice collection of vests! Hahaha no way! Well you really lucked out with his purchase. It's a stunner! I love this outfit too. 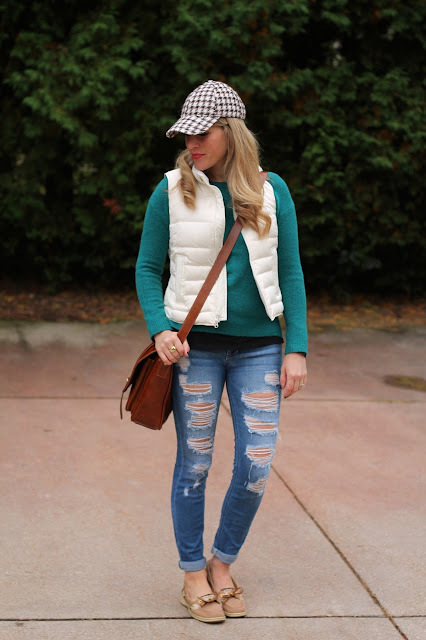 Super cute casual look. The bag and the hat - that's all I can see. And they truly make the outfit. That bag was a great buy. It is fantastic in black too, but I prefer the brown you have. Also, I think an iPad can fit there just fine. love these jeans, and this look is so perfect for Fall. I love a good crossbody- so easy to carry + travel with. I love this classic style! Oh wow what a fun site, need to check it out. I would have stolen the bag as well. Great story, his loss your gain! The bag looks great! That is so funny you got your husband into ifchic, and I'm glad the bag worked out for you!